What Is DD Form 1664? DD Form 1664, Data Item Description is a form containing a description of a data item to be delivered by a Department of Defense (DoD) contractor. This form specifically defines the data content, format, and intended use of the data with a primary goal of achieving standardization objectives set by the DoD. The latest release of the form - sometimes incorrectly referred to as the DA Form 1664 - was introduced by the DoD in August 1996. The most recent DD Form 1664 PDF version is available for download below. As of today, no free copies of the form can be downloaded from the Executive Services Directorate website. The DD Form 1664 cannot contain requirements for the performance of work tasks that may result in the generation of data. This information should be listed in the contract statements of work. The acceptance of inspection designations should also not be included in the form, however, the form might contain the evaluation criteria for acceptance of this data. How To Fill Out Dd Form 1664? collection of information if it does not display a currently valid OMB control number. PLEASE DO NOT RETURN YOUR FORM TO THE ABOVE ADDRESS. The first box of the form requires the title of the data item. The identification number is provided in Box 2. Box 3 is for the description of the data item. This should include its purpose, uses, and application. Box 4 is for the approval date of the item. The office of primary responsibility is entered in Box 5. Boxes 6a and 6b are for the address of a Defense Technical Information Center (DTIC) and a Government/Industry Data Exchange Program (GIDEP) respectively - if the Government organization or a contractor is required to submit copies of the data to a DTIC or a GIDEP. Box 7 requires an identification and description of the data, an indication of source documents and items in the contractual application and an explanation of terms provided in the form. Box 8 is for the information on approval limitations. The applicable forms are specified in Box 9a. Box 9b is for the Acquisition Management Systems Control (AMSC) number. Preparation instructions are listed in Box 10. 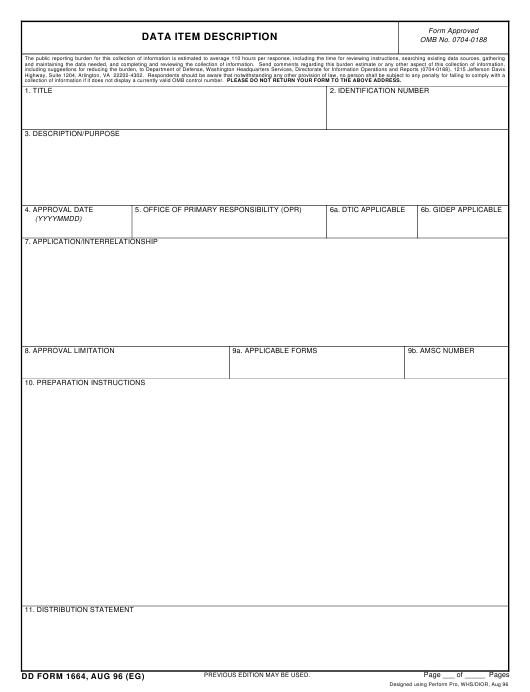 If the provided space is not enough, an additional copy of the form can be used as a continuation sheet with an indication of the continued item. Each page and the total number of pages should be specified in the lines provided at the bottom of the form. Box 11 is for any distribution statements, including the approval for public release or any restrictions.